Naperville city officials really like Naperville being ranked first. Not only first, but first at doing new things. It doesn’t really matter what it is, as long as Naperville is first. City officials let one get away. It could have been Naperville, but Honolulu beat them to it by announcing via text (ironic) that Honolulu was the first city in the United States to pass an ordinance against crossing the street while texting or looking at your phone / device. You can text, or you can cross a street, you just can’t do both at the same time in Honolulu. Doing both at the same time doesn’t make safe sense; passing the ordinance does make sense. Hence wouldn’t it make sense to have the ‘same’ ordinance in Naperville too? What’s the downside? Saving lives is good. Avoiding accidents is good. Adding money to the city coffers without making it a tax is good, right? Without the ordinance, texting while crossing the street is an outstanding method of population control. Without the ordinance, there is a much better chance that texting-drivers will meet texting cross-street walkers in an up-close and personal way. If city officials are hesitant to pass such an ordinance because they weren’t the first city council to do so, that’s no problem. They can simply re-define ‘first’ by stating that Naperville is the first city in the United States, not named Honolulu, to approve a ‘no crossing while texting’ ordinance. As Naperville continues to grow and become more dense, especially in the downtown area, this issue is only going to become more intense. In the meantime, if you have to be texting and want to cross the street in Honolulu, text an Uber. You might be doing the same in Naperville some day. Naperville has become accustomed to being ranked in Top-Ten lists, from schools, to libraries, to restaurants, to best places to live, etc. My personal favorite is Naperville ranking as “One of the top 30 Best Beach Towns in which to live in the U.S.” Who would have guessed that one. Frankly that ranking makes the others suspect, but anybody can rank anything in any order they want. It happened again just recently when the Human Rights Campaign Foundation ranked Naperville dead last in creating a friendly environment for LGBTQ inclusion (Lesbian, Gay, Bisexual, Transgender, and Queer). Naperville scored a first by coming in last place for something. Coming in last place is not an easy accomplishment. Fortunately for Naperville it wasn’t all Illinois communities, just large ones. Chicago scored the highest in Illinois for LGBTQ inclusion, followed by Aurora and Champaign. Chicago scored 100 points out of a possible 100, which means it doesn’t get any better than Chicago for LGBTQ inclusion. Naperville scored 42 (apparently a lot of opportunity for improvement) with the national average being 57 points. I say ‘apparently’ because what’s the problem? Naperville resident Eva-Genevieve Scarborough, (active in the LGBTQ community) said she is not surprised by the ranking even though she has never had an issue in the city. She did clarify that by saying she doesn’t always feel accepted. Does anybody ‘always feel accepted’; it’s rather doubtful. I don’t always feel accepted. As a member of the OGWWH community (Old Guys With White Hair), I accept that I’m not always accepted. I’m OK with it, that’s life. Naperville got dinged in the rankings for not having an LGBTQ police liaison or task force for reporting ‘hate crime’ statistics in 2015 to the FBI. Is this another classic example of a ‘solution’ looking for a problem? Apparently the fact that Naperville provides an environment of equality (being treated with dignity and respect) and inclusion works against Naperville in this ranking. If only we had some problems, we could rank higher. That’s a lofty goal. Let’s hope that city officials don’t do with this ranking what they did with the one resident who was upset about a few bees in her birdbath, when the the city council felt compelled to pass an ordinance placing restrictions on beehives. Sometimes doing nothing this the best course of action. If it’s not broken, there’s no need to fix it. A strange thing happened in Naperville over the weekend of October 12 thru the 15th. 7.8 inches of rain fell during that time period, one-half ml. or one thunderbolt short of eight inches. What’s really strange is that no residents appeared in front of the city council during public forum on October 17 to complain about flooding in their basements. Typically that happens like clock-work. You can count on a string of disgruntled residents voicing their frustrations to the council asking for a remedy. Naperville city officials have finally solved the problem of flooding. Residents have given up trying to get the council to listen and act on the problem. Everybody was too busy still trying to bail water out of their basements. Watching the Cub’s playoff game had priority. The next council meeting isn’t until November 7, so it’s possible the council will dodge the issue and few if any residents will be there to complain about their tale of woe. A number of streets in Naperville were closed due the flooding. One of the problems was the deluge of rained happened immediately before the first of three leaf pick-up cycles. Many streets were lined with neat piles of leaves at curbside. Add to that about 8 inches of rain and bingo sewer drains get clogged with no where for the water to go; hence flooded streets and basements. It’s not the City’s fault that leaves, rain, and bad timing happened at the same time. It could happen at the beginning of the next leaf pick-up cycle, or the last leaf pick-up cycle. However it would appear that city officials might want to consider other remedies for disposing of leaves. A friend from Tinley Park was driving through the maze of flooded or closed streets in Naperville that weekend and realized quickly that piles of leaves acting as dams in the streets didn’t make the situation any better. Apparently that problem doesn’t exist in Tinley Park. What do they know that we don’t know in Naperville. The Cubs are down three games to none to the Los Angeles Dodgers in the best of seven League Championship Series. One more Dodger victory and the Cubs are toast. You could say the Cubs have the Dodgers exactly where they want them if you’re an optimist. The Naperville city council and the Watchdog have something in common. We all wanted last night’s council meeting to get over quickly. It turned out to be one of the shorter council meetings; 75 minutes to be exact. I watched the first hour of the meeting, and then recorded the final 15 minutes, so as to not miss the beginning of the game. I have my priorities in order. Mayor Steve Chirico and councilman Kevin Coyne recused themselves during the meeting to avoid any conflict of interest on separate agenda items. Both left and returned very quickly. Chirico moved so quickly that if he would have been the last one to leave the chambers after the meeting, he could have turned out the lights and been in his car before the room got dark. The lead-off person has to set the table and get on base, with speed and a show of energy. She does this during meetings and isn’t afraid to take an opposing view. The center fielder is the leader of the outfield, quick, agile, in great shape, and sure-handed. 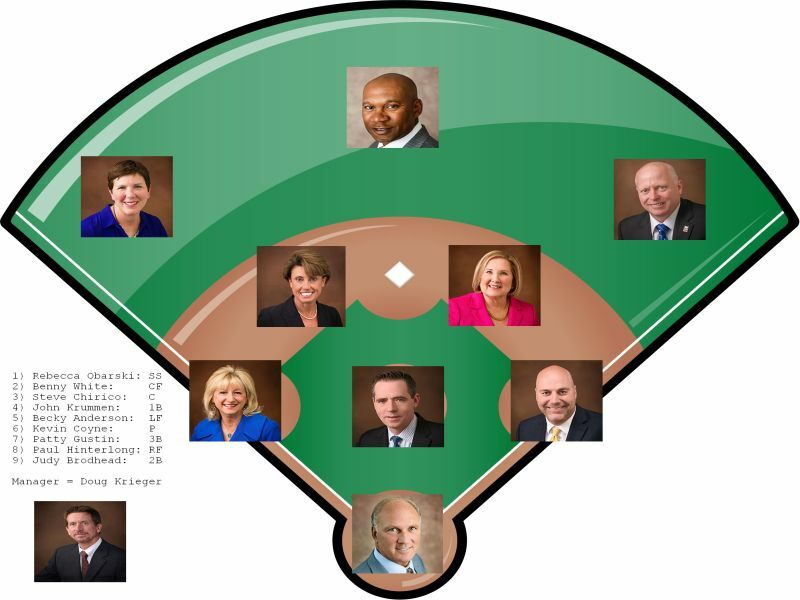 Benny has played error-less ball since getting elected to his first term. The catcher is the leader of team. Everything goes to and from the catcher and is involved in every play, often times getting hit with a pitch, a bat, or getting run over by a guy trying to score. If a kerfuffle breaks out, the catcher has to get things back in order. First basemen are typically bigger, lumbering types of guys, hitting in the clean-up position. They swing a lot, hence striking out a lot, but when they connect, they nail it big time. To say that Anderson belongs in left field is stating the obvious; many of her positions on the council are lefty-leaning. Left fielders get rid of the ball quickly, and Anderson is an expert at throwing the ball elsewhere. It all starts with the pitcher, the most watched position on the field. The pitcher has to be in control and stay calm during pressure situations. The third baseman makes long throws to first, hence can throw it wildly. No doubt that Gustin is long-winded and following her thought process can lead to the ball being overthrown. Third basemen have to react quickly without thinking and handle bunts and weird bounces, which makes Gustin a natural for this position. Right fielders tend to be the last one picked on the playground, but don’t let that fool you. They need to have the strongest arm in the outfield with good accuracy. Hinterlong has developed into a strong right fielder on the council with outstanding accuracy. Second basemen tend to have shorter range, and a weaker arm, with good reaction. Brodhead is perfect for second base. Somebody has to make the decisions in the dugout, and that’s the manager, or in this case city manager Doug Krieger. Managers oftentimes find themselves out on a very tiny branch, with their decisions being second-guessed. The City of Naperville has a successful revenue stream called the SECA (Special Events And Cultural Amenities) program funded by a food and beverage tax. It was established in 2004 and the fund was capped at $1.9 million. From that, $1.1 million is funneled for city obligations including Fourth of July fireworks, Riverwalk maintenance, the municipal band, DuPage Children’s Museum debt, Carillon maintenance, with a portion towards NDP (Naperville Development Partnership) funding. The remaining $800,000 is allocated through grants to numerous projects requesting funding including the Last Fling and Rib Fest, among many others. In 2018, 62 projects are seeking SECA money. Getting money into the program is easy through the food and beverage tax. Getting money out of the fund is not quite so easy, for those requesting the grants, and for those determining who gets what and how much. With more and more groups asking for grants, and more and more groups wanting more and more dollars, it can get tricky. That makes for more and more groups feeling either left out, or short changed. More and more and more is the common denominator. Two options include giving more dollars to fewer groups, or giving fewer dollars to more groups. A third option is to request that groups asking for grants ante up more dollars on their part. In other words, putting more ‘skin into the game’. There are only so many dollars to go around, so sooner or later the guidelines and requirements need to change. It appears sooner has arrived. Naperville city officials want (not need) about $6 million. For once I can agree with city officials because I also want $6 million. It’s nice to want things, it’s not so good to need things. Some city officials thought they had the answer when they proposed to double the city sales tax, but it didn’t happen. So most likely they will go to the next lowest hanging fruit and ask for a property tax hike. The answer is always the same; squeeze it out of the residents and taxpayers. Naperville city officials can’t seem to come up with a creative answer. But alas, maybe with a stroke of serendipity the council has stumbled on a possible solution other than painfully extracting it from the good folks of Naperville. The answer is right there in the numbers. Maybe, just maybe, Naperville councilwoman Becky Anderson was just one dot short of connecting the dots. A few months ago Anderson brought up the idea of making Naperville a ‘Welcoming city’. She didn’t quite have enough courage to use the words ‘sanctuary city’, so she went with ‘welcoming city’; it sounds so much more appealing and less threatening. Get ready for the missing ‘dot’; it’s the word ‘census’. The City of Naperville is considering approving a special census count in 2018. More people in Naperville means more money for Naperville. How simple is that. That’s the answer. Here is how it would work. If Naperville adds 4,650 people to its population count, it would bring in about 1.6 million in additional federal and state funding. If you extrapolate that to bringing in the $6 million the city wants, you would have to increase Naperville’s population by 17,437 for this special census, which equates to ‘welcoming’ one new person for every three homes in Naperville. Naperville would have to make it happen fast before the census. If a bus holds 100 people, it would take only 175 bus loads of people. Drop one person off at every third house. Bingo, problem solved. No increase in city sales tax, and no property tax hike. The only downside to the solution is that Anderson would be assured of at least 17,437 votes in her next election. One way or another, the tax ‘man’ is going to get you. That should be the new slogan for the City of Naperville. When it comes to balancing the budget, Naperville city officials see two options, either increase the city sales tax or increase property tax. Cost cutting measures are a distant choice, in fact it’s so distant, that it’s seldom considered, and if it is considered, it’s quickly dismissed as too difficult. It’s much easier and quicker to ‘stick it’ to residents and taxpayers, than to creatively figure out how to reduce expense, plus reducing expense isn’t much fun. At a recent Naperville city council meeting, council members bantered back and forth about doubling the city sales tax from .5% to 1%. The end result by a vote of 5 to 4 was to keep the city sales at .5%. Normally that might be considered good news, except for the fact, that that raising property tax is now the quick fix for city officials. Increasing property tax is worse for the good folks of Naperville because there is no way of getting around that tax, whereas if the sales tax was increased, the good folks would at least have an option, to buy it or not buy it, and if they are going to buy it, they have a choice as to where to buy it. It’s possible those five might hold strong on reducing expense, but the smart money is saying they will fold like a bad tent, when push comes to shove in favor of increasing property tax. Naperville city officials will always find a need (more like a want) to increase revenue, and as Naperville city manager Doug Krieger so often reminds us, the way to fill a financial hole is fill it with cash from rate and taxpayers. Just about everything that can be said, has been said over the years regarding mass shootings. News outlets mention that the Las Vegas shootings rank as the worst in ‘modern day’ history, implying there must have been some events even worse in terms of the number of deaths. There were, one in East St. Louis in 1917, and the other in Colfax, Louisiana in 1873. The first in my memory was August 1, 1966 at the University of Texas in Austin when 25-year old Charles Whitman, a former Marine sharp shooter, climbed the stairs to the top of the bell tower, and killed 15 people while injuring 31 over an hour and a half. I was 22 years old and in Europe, and people would ask me how an American can do this to other Americans, and I was at a loss to explain it. Here it is a half-century later and I still can’t explain why it continues to happen. If there is a difference over that time, it’s that people have gravitated into one of two main camps; advocates favoring gun control, and supporters of the Second Amendment. The commonality of those in each group, is that it’s difficult if not impossible for them to change camps. Tuesday October 3rd, folks gathered in Naperville to attend a vigil to remember the victims of the Las Vegas shooting. A number of people spoke including Naperville councilwoman Becky Anderson. She said, “We have to do something. We won’t let this happen again.” That is a bold statement. I don’t know what she has in mind, or what her solution is, but whatever it is, it would have been so helpful if the answer was known on July 31, 1966. A friend once told me, “if I told you to have more fun, you’d make a job out of it”. I thought it was strange, but the more I thought about it, the more I realized he was right. If my family went on vacation, I would research the area, and make a list of everything we wanted to see, and schedule each day to the fullest, with little time for the washroom, to get everything in. It was work scheduling fun. One summer we decided to go to the St. Louis Zoo and the Milwaukee Zoo, along with sights each city offered including tours of Budweiser and Miller Breweries. The end result was that there were six elephants in St. Louis, and three in Milwaukee, and the Budweiser Brewery was bigger than Miller Brewery. Two elephants would have been adequate, and a smaller sampling of beer would have been sufficient. More doesn’t make it better, it simply makes it more. Now the Naperville Library is knocking on city council’s door wanting more money to the tune of $599K. Couldn’t they have made it an even $600K; what’s one more “K”. Whomever is working out the numbers, must do a lot of retail shopping where every price ends in a ‘9’ to make it sound less. The thought must be that the council will balk at $600K, but they will gladly fork over $599K. No doubt that Naperville has a highly regarded library, but it’s time to level off and reduce the expenditures. Unfortunately libraries are trending downward as are newspapers and the postal system. It’s possible someday Naperville’s library will become part of the historical society, so kids of the future can see what a library used to look like. The library wants more money because they have had a ‘decrease in revenues’. It looks like the library did too good of a job of getting people to return books on time resulting less fines. Maybe the library could take a page out of the red light camera book (pun intended) and raise the fine for returning a book late to $1K per day. 600 days would solve the problem. Remember it’s for the kids. The library also said they are getting less revenue from investment income. That sounds like an opportunity for a Naperville resident specializing in investment income. The library board approved a tentative budget for $14.6 million in expenditures vs. last years budget of $13.8 million. My trustworthy little $2.00 (not $1.99) calculator shows an expenditure increase of $800K more this year than last year. Trim that by 75% and bingo, the $600K is covered. If the library has 10 English dictionaries, do they really need another one. Two should be sufficient, just like elephants in a zoo. If they really want to trim expense, keep the Webster’s Dictionary and sell the Funk & Wagnalls dictionary to the Naperville Historical Society; it will be there sooner or later.